There is a trend I’ve noticed lately (although I’m sure it’s been around longer than since I noticed it). It is the use of the acronym AF. People might text or tweet a sentence using it like, “I’m tired af”. I had to look it up. To state it bluntly, the acronym AF translates to the curse word, as f***. 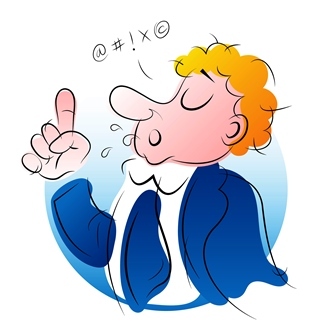 It may seem slightly better than dropping a full-blown f-bomb (if you don’t know what an f-bomb is, don’t worry about it; you don’t need to know) but it represents a curse word that most people try not to use in public. It has become a cutsey habit that seems to be cropping up everywhere. I actually received a business email that used AF in it’s subject line, as in, “Is Your Skin Dry AF?” I was a bit disconcerted – actually, I was shocked. This is a professional business that I purchase products from. I discovered the owner thought it was funny and a cute way to express very dry skin. I thought about people’s use of AF in reference to what God has to say about Christians following the ways of the world (people not serving or sold out to God and His ways). Just as this woman got on the AF bandwagon because everyone else is using that acronym, many Christians act just like the world because there doesn’t seem to be anything wrong with it. After all, everyone is doing it. Hosea 4:6 says that we, His people, are destroyed because we lack knowledge (of God’s Word, ways and commandments). The Proberbs scripture is talking about people who don’t care what the Bible says especially if it conflicts with what they WANT to do. God calls that person a fool. Don’t get offended; just check out Proverbs. The word “fool” is all over that book in the Bible, at least 41 scriptures. God said it, not me! God also says we are to “be holy.” A simple definition of holiness is this: to love what God loves and hate what God hates. You will have to make choices that oftentimes are totally opposite what the world says is okay, cool, perfectly fine to do. Let’s not be a fool. Let’s not be foolish people who follow in the footsteps of the world people. Let’s find out what God loves and God hates – it’s in His Word (Bible). I personaly do not want to be considered stupid by God! I am not going to be stupid AF – as fools. NO. I’m not perfect but I am working on it! I like that. I was stupid but I am no longer. I don’t want to do things the worlds way I want to follow the kingdom of God principles. That is where success comes from. Next Post Is Your Past Ruining Your Future?